I met Jim Feldott yesterday in Mt. Dora and had a shot of his Magic Juice. I’m used to apple cider vinegar, fresh ginger and cayenne, so I was prepared for the kick. I wasn’t prepared for it to be so delicious. I bought a bottle on the spot. I both use a half shot straight with a water chaser, and also use it as a salad dressing with olive oil on fresh organic greens. I know the science and I’m a believer. Jim told me he didn’t have a computer and he didn’t have a website, although one is in the works. Until then, I wanted to help get the word out about him and his Magic Juice. I loved it so much that I ran home and created a website for him. I already knew of the extraordinary health benefits of the ingredients he uses, but frankly, the taste — and his engaging personality — is what sold me..
You can call his number and ask if a health food store in your town has it, in Brevard County, Sunseed in Cape Canaveral carries it. This entry was posted in Uncategorized on February 27, 2011 by Andrea. 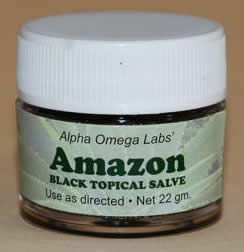 I just bought some Amazon Salve, formerly known as Cansema (bloodroot.) I used it in 2002 and 2011 for some facial skin cancers with great result. It’s a thick black paste which you apply to the spot. There are no adverse reactions and it cannot harm healthy skin. But on cancerous cells, it turns all black and weird and crusty and if you don’t read about it beforehand, you’ll freak yourself out. I found my notes from 2002 and wanted to share my experience with you. (My notes from 2011 are here.) Also below you will find the instructions for using Cansema. This entry was posted in Uncategorized on February 11, 2011 by Andrea. This entry was posted in Uncategorized on February 3, 2011 by Andrea.